The WGA‘s recent seminar on e-publishing revealed how this storytelling arena has just exploded in a few short years — and it’s indeed become a legit pool of intellectual property for Hollywood to draw from. It seems like an eternity since the last update of Final Draft, but in fact it’s only (!) been 4 years — which is an eternity in a time when Firefox and Chrome seem to update nearly weekly. During this time, Celtx has developed a suite of (semi-)integrated screenwriting tools; Adobe has developed Story as part of its Creative Cloud; screenwriter John August and others have developed the Fountain markup language as the foundation for a number of new authoring tools; cloud storage has become de rigueur due to Dropbox and other services; and script composition on the iPad and other tablets has become increasingly desirable. As this is primarily an archival site for the decade+ of alt.screenwriters columns published in the WGA trade magazine Written By , I don’t get around to posting on this much (since I teach undergraduate screenwriting full-time, have two book blogs to maintain, and still work as a professional screenwriter, time permitting) — but I’ll direct the reader to a new post about videogame dialog scripts on the End to End Game Development book blog. A reminder here that my earlier book, Story and Simulations for Serious Games , also discusses videogame scriptwriting. Today’s professional screenwriter should be able to move between film, TV and interactive media — and knowing how to format narrative for any of these platforms is a basic piece of knowledge to have. Mastering Celtx has its own blog, and recent posts have included discussions of screenwriting for documentaries and videogames. More posts on the nuts and bolts of screenwriting (as they relate to Celtx) are scheduled. For scriptwriters working on the “bleeding edge” of media convergence, this is definitely worth investigating. The day of Mastering Celtx ‘s official release has arrived. Find the book on Amazon and at Barnes & Noble, or just about any other online book vendor you prefer. You can walk into a brick-and-mortar Barnes & Noble or Borders and also order the book for pickup. Can’t get enough of Mastering Celtx ? Check out the book’s blog and Twitter feed. Love to hear what you think. My new book Mastering Celtx will soon be published, and in the meantime, you can follow the Mastering Celtx Twitter feed — for the latest book news and Celtx news. Terry Borst began writing under the alt.screenwriters column banner in 1996. 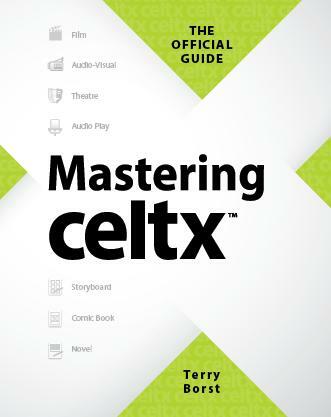 2011 unveiled MASTERING CELTX, a book about new approaches to screenwriting and preproduction. Occasional posts continue to discuss the collision of contemporary screenwriting and media convergence.